All instruments are steel-strung (except ukuleles, which are strung with Aquila Nylgut® strings, and nylon-strung guitars which are available to special order), 'flat-top', 'flat-back' and constructed from selected, solid tonewoods (see separate specifications for banjos). Mahogany is usually used for the neck, blocks and kerfing while strutting, bracing and tops are spruce or cedar. 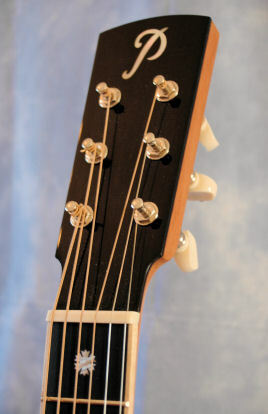 All tops feature a bracing system unique to Pickard Acoustics. Fingerboard and bridge are either ebony or rosewood and back and sides are usually mahogany or rosewood. A variety of other woods is available especially for the back and sides. The nut and saddle are bone and the bindings are wood or plastic. Mother-of-pearl is the usual inlay material. A fully adjustable truss rod is installed in each steel-strung instrument while Nylgut®-strung necks are reinforced with carbon fibre. Quality machine heads are used throughout the range. The finish (since 2003) is a water-based urethane/acrylic and is applied and polished by hand. An oiled finish will be an option from 2016 giving a durable but natural looking finish to any instrument. (N.B. Left-hand models of ALL instruments are available at no extra cost).